Why is My Furnace Blowing Cold Air? What can I do about it? You are here: Home / HVAC Info & Articles / Articles / Why is My Furnace Blowing Cold Air? Your furnace is supposed to heat your home in cold weather, keeping you toasty warm on even the coldest of days. So why is it suddenly blowing cold air? If this happens to you, it can be puzzling, frustrating, and very uncomfortable. 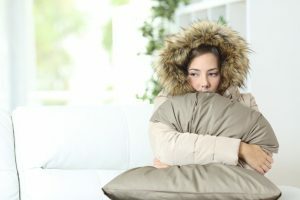 There are many different causes for this, most of which require heating repair by an HVAC service. Thermostat issues. If your thermostat is not working properly or is on the wrong setting, it can fail to call for heat and simply blow cold air. Empty fuel tank. You may be out of fuel if your furnace runs on heating oil or propane. Call your supplier for a refill and consider signing up for automatic refills in the future to keep from running out. Pilot light is out or electronic ignition is faulty. Old furnaces have a pilot light that stays lit throughout the heating season. If this goes out, the furnace won’t have heat. Newer furnaces have an electronic ignition that only lights when the thermostat calls for heat. A faulty ignition could be the culprit. Build-up of dirt or soot. When your furnace gets dirty it can cause a variety of problems. The oil filter can get clogged, the oil valve can get stuck, the burner can fail to ignite, and the flame sensor may become compromised.Yearly maintenance and cleaning can keep this from happening. Leaky ductwork. When there is a leak in the ductwork or if is not sufficiently insulated, the warm air can escape and cold air can get in, meaning you might feel cool air coming from your vents. Computerized systems. Newer systems have computer controls that may just need to be rebooted. Turn off the power to your system and turn it back on, and see if you start feeling warm air again. Furnace is overheated. Have you changed your filters recently? Clogged filters compromise air flow to your furnace, which can cause it to overheat and quit working. If you feel cold air coming from your vents, it could mean you are in need of heating repair. Check your filters and your thermostat. Turn off the power to your furnace and turn it back on. If the problem persists, call Berico: (336)496-1039. Berico’s certified technicians can quickly diagnose the problem and provide a solution. Do you want to make sure there is always warm air flowing from your vents when the weather is cold? Annual furnace maintenance involves cleaning, inspecting, and repairing your system to keep it running efficiently. Most of the problems listed above can be prevented with a yearly tune-up from your HVAC company. You will save money by avoiding emergency repairs and keeping your energy bill low. Berico’s Comfort and Protection Service Plans include yearly maintenance and fuel delivery to make sure you never run out of fuel or suffer from furnace failure.Call to sign up today: (336) 496-1039.
https://www.berico.com/wp-content/uploads/2018/12/header-logo-new-3a.png 0 0 Berico https://www.berico.com/wp-content/uploads/2018/12/header-logo-new-3a.png Berico2017-12-15 15:30:142018-01-24 20:11:58Why is My Furnace Blowing Cold Air?